Last time I made this simple and semi healthy desert I didn't even get a chance to try any! Everyone gulped them up in a second. So I guess I could say they were a hit! This past weekend I made them again for a family gathering and again were enjoyed by all. 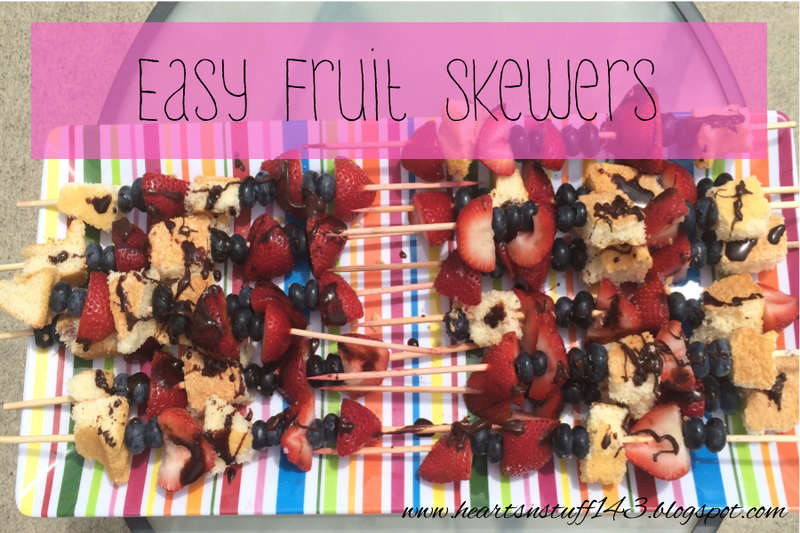 They are so simple to make and are refreshing change from normal fruit on top of a cake. Start by washing the fruit and cut the strawberries. Cut the cake into cubes. Make sure they are thick enough so the won't break when eating. I added blueberries first and then did a pattern of pound cake, strawberry and two blueberries, but you can do any pattern you want to just random! Finish by drizzling melted chocolate. If you don't have a chocolate bar or melts, you can also use chocolate syrup!